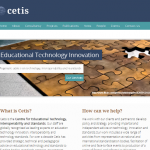 Cetis maintains three sites: there’s our main website or home, our blogging site and our publications site. Our main website describes us and our activities, if you want to know who we are, what we have done and how we can help you, then this is the best place to look. Many of our staff write regular articles on their individual blogs, covering their various areas of interest and expertise. These are aggregated here, with each post linking to the author’s individual blog. 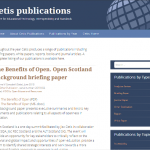 Throughout the year Cetis produces a range of publications including briefing papers, white papers, reports, books and journal articles. A complete listing of our publications is available here.